As a journalist Ernest Hemingway was trained to cut to the story's essentials, leaving out those words that stand between the writer and his intent. And so we have a Hemingway principle of good writing—the well-hewn sentence. It is said that Ernest Hemingway was challenged to write the shortest of short stories: the ultimate example of brevity in storytelling. Though perhaps apocryphal—no one can tell us who challenged him or on what occasion—this was the result: “For Sale, Baby Shoes, Never Worn.” Writers have attempted to equal this six-word short story with six of their own, but no one has clearly beaten the master. Those six words are just too good. 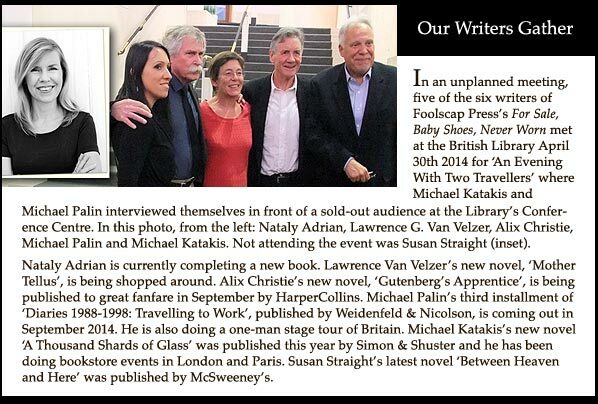 Foolscap Press commissioned six writers each to write a six-page story where only the title was supplied. The writers were free to do whatever they chose within those parameters. We invited three women and three men in order to balance personal experiences and writing styles. The response is these six extraordinary stories stocked with a captivating cast of characters. And, yes, there is a distinction between the men and women writers. And what happens when it comes to dealing with an unmitigated loss (as the title might suggest)? You can read for yourself these six creations spun from six very different imaginative worlds, all in response to those six tantalizing words. Alix Christie is a journalist and writer whose work has appeared in the Washington Post Magazine, San Francisco Chronicle, Other Voices, Salon.com, and The Economist, among other publications. She is finishing a novel about Peter Schöffer, Johannes Gutenberg's apprentice in the workshop that produced the first book from movable type. Michael Palin, actor, travel writer, screenwriter, documentarian, and comedian, is the author of many books, including travel books, an autobiography, diaries, fiction, children's books, and a play. He was formerly an integral part of a small circus. Susan Straight is the author of Aquaboogie, I Been in Sorrow's Kitchen and Licked Out All the Pots, Blacker than a Thousand Midnights, The Gettin' Place, Highwire Moon and A Million Nightingales. Her new novel is Take One Candle Light a Room. Her stories have been anthologized in many collections. She teaches creative writing at the University of California, Riverside. Michael Katakis is a photographer as well as the author of The Vietnam Veterans Memorial, Sacred Trusts: Essays on Stewardship and Responsibility, Despatches, Traveller, and A Time and Place Before War. His photographs have been exhibited and published widely. Nataly Adrian lives and writes in Paris. She is the author of The Destiny Book, and The Secret in the Shell. Lawrence G. Van Velzer is the author of Desert Dreams, Tower of the Winds, and Herakles and the Eurystheusian Twelve-Step Program and many short pieces. 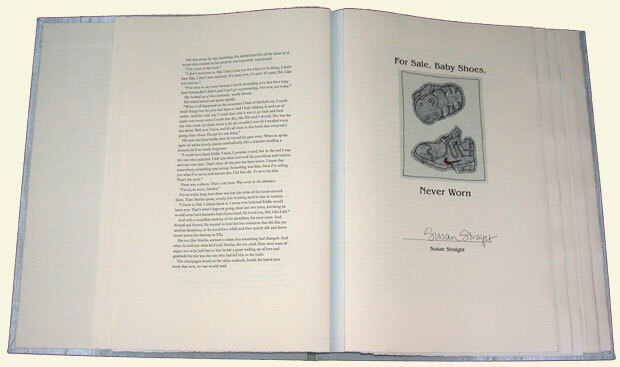 For Sale, Baby Shoes, Never Worn is published in a limited edition of 200 numbered copies of which 140 copies are for sale. 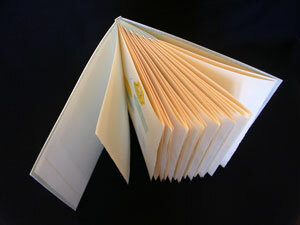 The book is printed letterpress on Frankfurt Cream text paper using hand-set Garamond type. The book measures 15" by 13" and consists of 60 unpaginated pages. Each story is signed by the author and has its own title page decorated with collaged prints of pairs of shoes by Peggy Gotthold on Kitakata paper. The book is bound in Japanese cloth and is sewn onto a modified accordion structure designed so that each story is presented individually. The price is $550.00. plus appropriate CA sales tax. Shipping: $15.